Homepage. This page: A chrome rad 10hp Austin turns up. For a while I'd hankered for something pre-war, as vintage cars have always appealed to me. 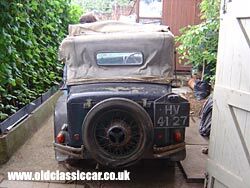 This Austin is my first pre-war car since the early 1990s. Some of my favourite pre-war British cars are the tourers, but they usually cost ££££ for good examples, with untouched examples needing some TLC very hard to find. Needless to say, when I found a 1934 chrome rad Austin 10/4 cabriolet, for reasonable ££ and in complete condition, I jumped at the chance. Not quite a 'barn find', but definitely a near-vintage car that hadn't seen light of day for many many years. It seems that the Austin has only had 2 or 3 previous owners since '34, and was last in regular use during the early-mid 1960s, with a single journey from London to Somerset being made during a housemove in 1971. Since then it has sat on blocks, sheeted up and untouched. Original picture showing a nearly vintage chrome radiator Austin 10/4 cabriolet. 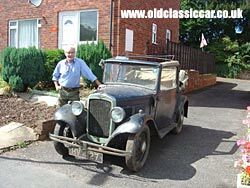 More photographs from when we collected this 1930s Austin Ten, in August 2006. 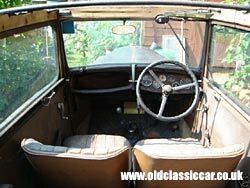 Perhaps unusually for a car sold online, the Austin's condition was pretty close to that given in it's description, with very solid coachwork and interior trim that should be usable 'as is', once cleaned and treated with various hide products. The dashboard is complete, although the fuel gauge looks like it may be from a 40s Austin, and even the wind up clock still ticks away merrily. The three position hood is perhaps the worst part of the car, but thats not exactly surprising after 70+ years. It is however good enough to be used as a pattern, and the glass rear window can be re-used. As mentioned, both the steel bodywork and the wooden frame in this 10hp Austin are in solid order, the doors opening and shutting as well as they did back at the Longbridge factory. The wheels will come up ok once blasted and repainted, but the tyres are shot and will also need new inner tubes and rim tapes. If anyone has some good usable 4.50 x 18 tyres for sale, please let me know! Roping in some friends who have a good trailer, we ambled southwards to collect the baby Austin Ten in August 2006. The couple who owned it had bought it in the early 60s, and used it for lots of touring holidays around Cornwall and the surrounding areas. I'm hoping that they'll send me copies of olde worlde photographs that they have, which show them and the car in action during the 60s. I think they were sorry to see the car go, but recognised that the likelihood of them ever resurrecting the car to roadworthiness is remote. With the car back at my friends' garage (until I make room in my own), I set to giving the old girl a clean up. The paintwork is distinctly average, having been brushpainted some 40+ years earlier, some of which is now peeling away. Perhaps one day it'll be repainted but for now I plan to leave it looking 'as is', wearing its age proudly and not looking like a newly-built 30s car. So long as the car's condition is good and solid, and there is no deterioration taking place, I don't see any need to bull it up at the moment. I'm not sure that er indoors agrees however! Next, it seemed like a good idea to get the old car running again. Austin 10s like this have 6 volt electrics, so I whipped the new battery from my E83W pickup and gave it a good charging up. First thing I did was make up some new HT leads, re-using the proper old Lodge plug caps with fresh new black leads. The dizzy cap looked in good order, as did the rotor arm so I left them alone (bar a clean up). The points were covered in crud, so were removed and gently cleaned up. They aren't perfect but plenty good enough to get the engine running again. I checked over the wiring, cleaning up connections as I went, til the ignition side of things seemed to be ok, with a healthy spark jumping across the points once the ignition key was turned to the first position. As a precaution, the old watery oil was drained out, and replaced with good quality lubricant. The sump in these Austins has a built-in filter arrangement, so I dropped that out and swilled it around with old petrol to clean it out. The fuel tank will need draining, so for now a temporary petrol supply was rigged up. The engine seemed to have decent compression, and was pulling fuel through ok, but try as we might, we couldn't get it to fire up properly. There was a decent looking spark at the plugs, and fuel was getting through. The timing was re-checked, as was the positioning of the leads sprouting from the distributor cap, and it all looked ok. Yet it still wouldn't fire for more than a few coughs at a time. Throughout, I had wondered if it'd be worth swapping out the coil for a replacement, so we gave that a go. With a s/hand 6v coil rigged up, we gave it another go and it fired up instantly, settling into a sweet purr. The oil pressure gauge shot up to a good level, and even the ammeter began to register a charge. Sadly the clutch is very very stuck, so driving the car out of the garage was not an option. We pushed it outside, to save gassing anyone in the garage, and let it warm up. This did highlight a few minor issues, such as a leak on the radiator, but at least it seemed to run ok. I must drain the yukky old fuel from the tank so that we can remove the temporary supply. Fixing the clutch will probably mean the gearbox needs to come off as it appears to be jammed/seized inside, but I don't think that'll be too tricky once the floorboards have been removed to get at things properly. 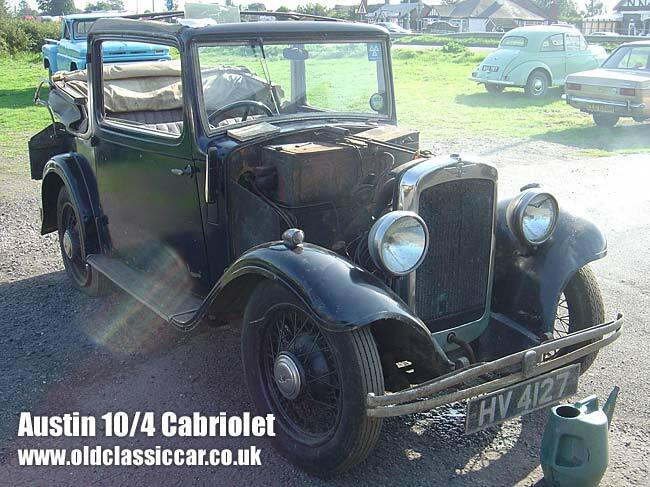 From what I can tell, the cabriolet version of the chrome rad Austin 10/4 was only made from 1934 - 1936, with the early cars having the chrome rad, and later ones the painted grille, and known thereafter as the 10/4 Colwyn cabriolet. My particular car was registered on 10th July, 1934 according to the old buff logbook. The colour was originally a dull grey, then changed to green, and finally given the blue overcoat that it still wears. A few nice old items came with the car, including perhaps its last tax disc, from 1963, and a sticker in the screen reminding motorists of the new '10 year test', or MOT as it would become known. Also included was an old petrol receipt from the White Horse Service Station, 267 Whitehorse Lane, London dating to June 1963. An old insurance cover note also came with the car, as did an MOT test certificate from 1966 and various fuel ration tokens. The car's final MOT certificate, from 1971, was also included. Update. After over six years of inactivity with this project, I reluctantly decided to part with it in a bid to cut down on the amount of work sat waiting for attention in the garage. 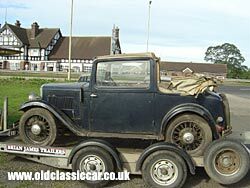 Links to other Austin material on oldclassiccar! Back to the my classic cars pages.